I first met Vic in 1968 when I went to see him at the Natural History Museum, then called the British Museum (Natural History). As a young, ambitious, and probably rather arrogant researcher, with a Royal Society grant to study genetic variation in aphids, museum taxonomists who spend their lives amidst dusty collections of dead insects ranked rather low in my estimation as scientists, and I think that all I expected from my visit was a name for the aphids that I was working on. However, I happened to mention to Vic that I was thinking of looking at aphid chromosomes. In those times long before Google it would have taken me quite some time to find out what, if anything, was known about aphid chromosomes, or how to go about the business of studying them. But Victor said “Wait a minute, I saw something quite recently about some work on aphid chromosomes done in Canada” and before I knew it he had looked up the reference and gone hunting for a reprint about it. I was of course delighted and thanked him profusely, which clearly embarrassed him rather, and after all these years I can remember exactly what he said: “Well, that’s what we are here for”. I think that epitomises Vic and his attitude to work, scientific activity and in fact to his relationships with people in general. So many scientists inhabit ivory towers and consider imparting what they learn to others as almost an afterthought. Victor was at the opposite end of the spectrum. He was a very unassuming and modest man, who often said how lucky he was to be doing a job that he enjoyed doing – almost a hobby. He had a unique knowledge of aphids – in fact not just of aphids but other Sternorrhyncha, and also the parasitic Hymenoptera that feed on them – but he also had a strong desire to help others in their struggles to learn about these amazing and intriguing insects. When I joined the Museum staff and started working alongside him on a daily basis this attitude rubbed off on me, and eventually with his friendly encouragement and persuasion we started to get all that knowledge and information into the form of several rather large books on the world’s aphids. I feel very proud and privileged to have worked with Victor on these, and now that we have lost him I gain some comfort and satisfaction from knowing that when he left us he knew that he had provided a substantial legacy to future generations of biologists. I know that this was very important to him. Victor Eastop was born in London and spent childhood years in Harpenden. His secondary education was at Ashby-de-la-Zouch Grammar School, after which he went to Reading University. However, his time as an undergraduate was interrupted by four years in the RAF (1943-47), where he underwent training in Canada as a navigator and served on Wellington bombers in the last year of the war. Recently he recounted to Keith Harris how one of his duties was to substitute for the gunner and get into the tail gun chamber on take-off in order to swing the guns clear of the ground. Back at Reading, where his future wife Barbara was a fellow student, he obtained his first degree in 1950 and then received an Agricultural Research Council grant to work on aphids at Cambridge, completing his MSc in 1952 and PhD in 1955. One of his first discoveries was the stridulatory mechanism by which colonies of the aphid Toxoptera aurantii act in unison, rubbing their legs against sclerotic ridges on their abdomens to produce audible sounds. Also at this time he made a definitive study of a group of root aphids, the Tramini, which was notable for its emphasis on the importance of studying morphological variation within species in order to identify them correctly. Much of Victor’s subsequent taxonomic work was based on the accurate measurement of aphid body parts under the microscope, as he had a unique understanding of how these measurements varied according to the conditions under which the insects developed. Interpreting such variation correctly is vital for correct identification of species, and over the years Victor accumulated many thousands of pages of data in his precious “green files”, with which to compare newly acquired specimens. In 1952 Vic was awarded a Colonial Office Research Fellowship to study aphids in East Africa. This was the time of the Mau Mau uprising in Kenya, and Vic recounted how he collected aphids with a Royal Enfield rifle always to hand for protection. Vic and Barbara had the first of their five children in Kenya in 1954. Returning to England in 1955, he joined the staff of the British Museum (Natural History) as a Senior Scientific Officer, but was soon in Africa again (now with two children), this time on secondment to the West African Inter-territorial Secretariat. Their third child was born in Ghana. Barbara did all the driving in Africa, as Victor never obtained a driving licence. While in Nigeria he did once try to pass the driving test, at Zaria. There was one short stretch of one-way street on the way to Zaria market, which at the time was one of the few one-way streets in northern Nigeria. During the test Vic’s training as a navigator deserted him at a crucial moment, and he drove down this street the wrong way, thus becoming one of the small group of people at that time to have failed a Nigerian driving test! 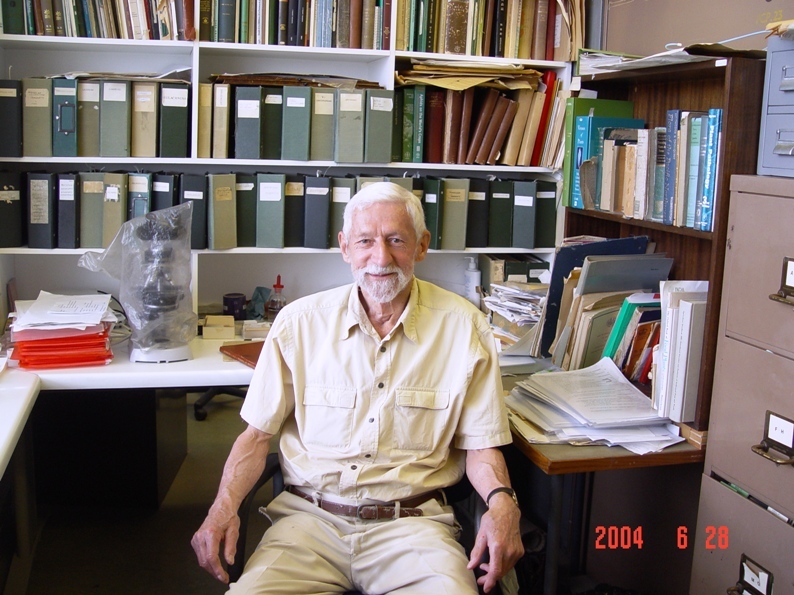 His work in Africa eventually led to publication of the first definitive accounts of the aphids of East (1958) and West (1961) Africa, still much in use today. Vic made many other overseas trips in subsequent years. His time in Australia as a British Memorial Foundation of Victoria Fellow in 1959 led to publication of an account of Australian Aphidoidea (1966) that is still much used by Australian aphid workers. He has also been a visiting scientist to New Zealand (in 1959, 1972 and 1983), Israel (1982), Beijing (1985) and had visiting professorships to Brazil (1972-73), Sweden (1973 and 1978), and Iran (1978). He acted as an FAO consultant in aphid taxonomy in Cyprus (1981) and took part in the RGS Gunung Mulu expedition to Sarawak (1978). In more recent years there were visits to Japan, USA and Canada, and further visits to Australia and New Zealand. At home he has served on the Councils of the Linnean Society (1977-81), the Systematics Association (1977-81), the Royal Entomological Society (1970-74, 1985-9), and been Vice-President (1971-74 and 1986-87) and President (1987-89) of the Royal Entomological Society. Victor certainly did not conform to most people’s ideas of a museum taxonomist. For many years he attended almost every one of the Royal Entomological Society’s monthly meetings at 41 Queen’s Gate, and no matter what the subject matter of the talk he could usually be relied upon by the chairman to ask the speaker a pertinent first question. Among more than 170 publications are many that show the breadth of his interests. In the late 1960’s and 1970’s, as well as taxonomic revisions of several important aphid genera, there were accounts of flight activity of aphids and of the biology of their natural enemies, analyses of the host plants and geographical distribution of aphids and psyllids, and reviews of aphids as vectors of plant viruses and as pests of rice and small grain cereals. In 1976 he produced (with D. Hille Ris Lambers) a Survey of the World’s Aphids, the first publication to catalogue aphids on the world scale. Until then all taxonomic work on aphids had been restricted to particular regions of the world, but many pest aphids distribute themselves around the world on crops and ornamental plants, so publications that cover the whole world are most appropriate. Vic was convinced that this was the way to proceed, and after some friendly persuasion this led me into collaboration on Aphids on the World’s Crops (published 1984, reprinted in 1985, and with a CD version in 1998 and a second edition in 2000). The success of this led to further collaborations that produced Aphids on the World’s Trees (1994) and Aphids on the World’s Herbaceous Plants and Shrubs (2006), to complete the coverage of the world’s aphids, the first publications of this kind on any group of insects. The keys and information provided in these books were made possible by the data that Vic had accumulated so meticulously over many years, helped also by the massive data base provided by the Museum’s aphid slide collection. Again, Vic was mainly responsible for refining the system of tab-cards used in the collection, so that it is easy to access information about host plants, distribution, seasonal occurrence and variation of each species. Victor liked to run. For many years he was a regular competitor in the London Road Runners’ monthly 5 km road races, and a member of the Museum’s running team in races over 4-10 km. When he lived at Kew he was a familiar figure jogging along the Thames towpath, stopping occasionally if an aphid colony or other insect caught his eye. He also played a lot of cricket, opening the batting for the Museum cricket team, and for the second eleven of Kew Cricket Club, playing in the beautiful surroundings of Kew Green. He played for Kew C.C. for so long that younger members refused to believe that he was the same Eastop as appeared in early scorebooks. They thought it must have been his father! He also spent many hours in Kew Gardens, adding numerous samples of aphids from named host plants to the museum collection. His field work at home and abroad was recorded in a series of pocket-size notebooks, the total number of samples that he collected eventually exceeding 20,000! For the last six years of his life, after his wife’s death, Victor lived at Henley-on-Thames, where he enjoyed leisurely walks in the countryside and visits from his children and their families; the number of grandchildren reached ten in 2010, with the birth of twins to the wife of his son Frank, the youngest of his five children. In the last week of his life he was still answering e-mail queries from all over the world, and in his last year he paid several visits to Rothamsted, discussing projects and helping with identification of trap catches. Knowing Victor’s character and unassuming nature, I feel sure that he left this world exactly as he would wish to have done so, with his extraordinary memory undiminished, and his deductive powers fully intact; quietly and peacefully and with the minimum of fuss, leaving happy memories with his family, friends and colleagues. Reproduced from Antenna 36 (3), 155-157.